I started bringing Willie to work to socialize him. Everyone fell in love with him, especially the owner who bought him this costume. 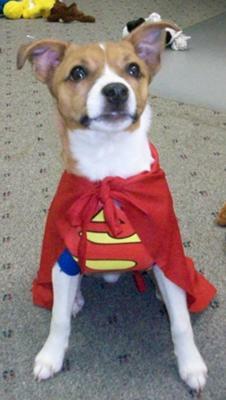 Willie loves wearing it and takes his workday duties very seriously (paper shredder, trash can emptier, office clown)! So so so cute! I love the costume and love that he has his own set of jobs to "save the day". I wish my office allowed dogs to come in. I'm sure Willie helped to lift the office mood and make work a little more fun.